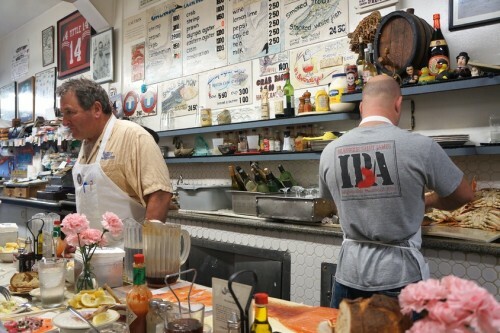 We couldn’t come to San Francisco without a meal at this iconic seafood institution – it’s been around for over a hundred years! Popular with both tourists and locals, Swan Oyster Depot is notorious for their long waits, so plan your visit accordingly. The space is essentially made up of one long counter so as you can imagine, they can’t seat a tremendous amount of people at once which just adds to the wait time. We arrived around 11:15am on a rainy Friday and we were shocked to see a small line which barely spilled out the door. We only waited for 10 minutes and after eating, we were out by 12:15. Super lucky! The restaurant has a very old school diner-ish feel. You won’t find printed menus here – check the wall behind the counter for their offerings. While it’s a no-frills kinda joint, it certainly isn’t cheap. We ended up spending $100 on lunch and we didn’t even order alcohol. Oh, and bring cash – it’s cash only. 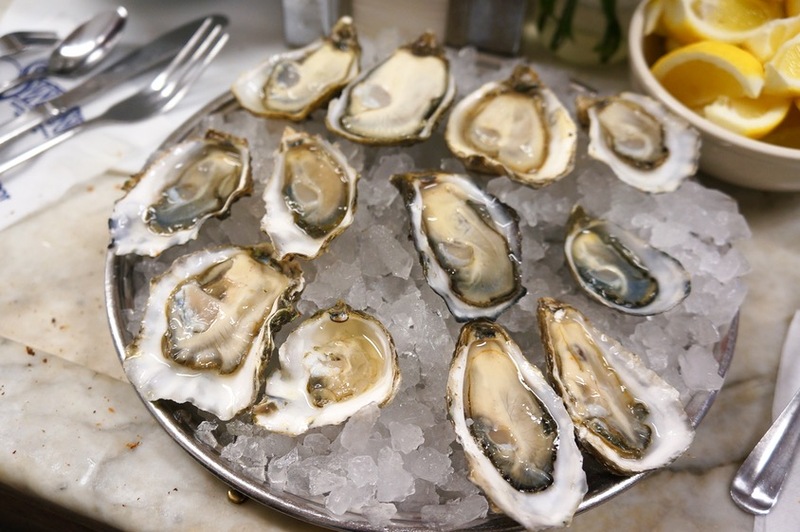 We started out with a Mixed Dozen Oysters ($32) which consisted of both east and west coast oysters. It was a nice selection and I appreciated the fact that there was a good mix of small and large varieties. The Crab Back ($6) is a must-order and a steal at only $6! 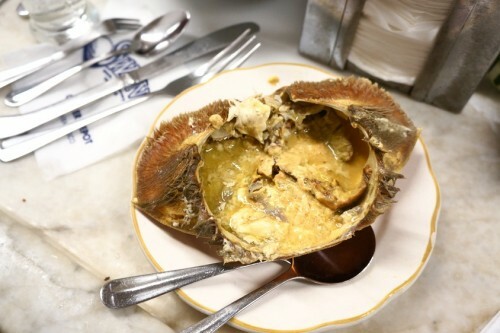 It’s not the most appetizing looking dish with an off-putting shade of yellow (it’s crab guts, after all) but if you can get past all that, you’re in for a treat. Served cold (which surprised me), the insides are liquid-y in texture with soft creamy bits in it. Served with sourdough bread, this is insanely good and worth all the cholesterol. Up next was the Crab Salad ($29). This was easily the most I’ve ever paid for a salad, which, for my Canadian readers, is the equivalent of around $40 CAD at these (terrible) exchange rates. On the plus side, they certainly don’t skimp on the crab. 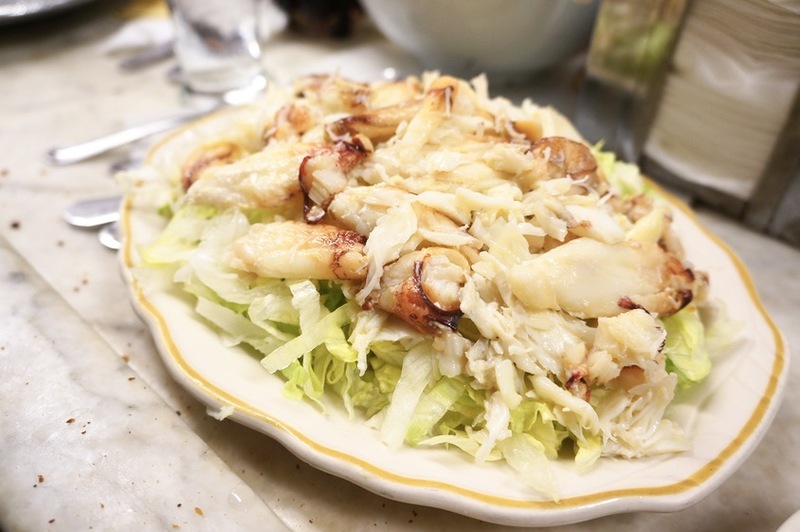 The salad consists of a huge mound of de-shelled crab chunks sitting on a bed of iceberg lettuce. The dressing was reminiscent of a Thousand Island dressing and while the dressing was tasty, the crab didn’t really need much of it (if at all). We finished off our meal with an order of Sicilian Sashimi, an off-menu item but something that most people seem to know to order. Unlike Japanese-style sashimi, it’s served Italian style – simply drizzled with olive oil and topped with capers and chopped red onions. Today’s selection included scallops, ahi tuna, salmon and yellowtail. My personal favourite was the scallops. I could’ve eaten an entire plate of those alone! What I loved about this place was the incredible hospitality. Even though they knew most of us were tourists, they were ridiculously patient with us and there was never any pressure or hint of annoyance despite all our questions. They also didn’t seem like they were in it to turn tables as quickly as possible. They don’t rush you at all. But having said that, please don’t linger after your meal. There’s going to be huge line of people out there waiting for the same great meal you just had. 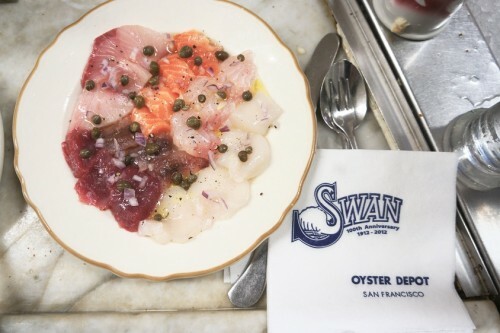 Needless to say, Swan Oyster Depot was worth the hype.